Made out of 3/16" thick steel plate, the new PUREJEEP Crawler Rocker Guards are designed, laser cut and precision formed to fit perfectly on the curved body of the Jeep JK Wrangler and protect its rockers from the punishment you'll be throwing its way on the trail. Made out of 3/16" thick steel plate, the new PUREJEEP Crawler Rocker Guards are designed, laser cut and precision formed to fit perfectly on the curved body of the Jeep JK Wrangler and protect its rockers from the punishment you'll be thowing its way on the trail. 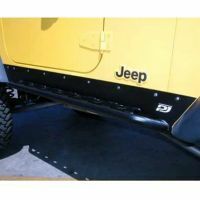 Our Jeep TJ rocker guards are made from laser cut and precision formed 3/16" steel plate. They feature a stand-off bar made from 1.5" x .188" wall DOM tubing that has a welded dimple-died step for traction. THESE ROCKERS HAVE AN ANGLED FRONT LEADING EDGE TO LINE UP WITH THE STOCK PLASTIC FLARE. THESE ROCKERS HAVE A SHEARED FRONT EDGE TO WORK WITH AFTERMARKET FRONT TUBE FENDERS.